The Official Twitter account for High School DxD Hero (Season 4), Revealed the new season of the anime is set to air April 10, 2018, Alongside this announcement the official website revealed a new Visual/Poster for the series. While also announcing that the series will have a private advance screaming of the anime 1st episode on March 30, 2018. Sadly that’s not something that will affect us in the west. But maybe it will give us a chance to see what people think of the series New Art Style. High School DxD Hero official website also previously released a trailer for the series. 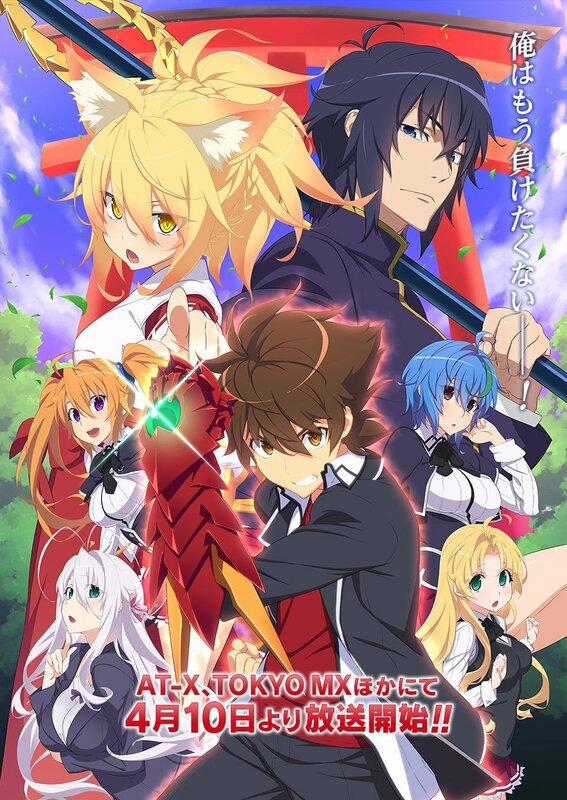 It was also announced all the previous voice actors will be returning for the new season of DxD. The very first thing you notice when you see this series is the drastic change in art style compared to the previous seasons. Many would ask why this is happening. Though not much info on why it is happening. The obvious reason would be the fact that a brand new studio took over production of the series. Studio Passione, Best known for animating the currently Airing Yuri Romance Citrus. Took over production for the series from Studio TNK. Why couldn’t the new studio replicate the art style of the previous seasons? The New Studio probably couldn’t do it. Because it’s clear the main character designer for the previous seasons is no longer working with the series. There might be more reason for why he is not with the series anymore. Maybe background conflict or he was to busy with another series, Or the new studio didn’t have the money to hire him. Honestly, we will never know until more info is revealed. For Now, High School DxD Hero has a tough road ahead of its self. It will be faced with a lot of criticism when it airs due to its new Artsyle. But hopefully, fans of the series deal with this new change because if they start attacking the series because of its new art style and it sells horribly in Japan due to everyone’s hate. The you who is a fan of DxD will suffer for it because it means your favorite series won’t receive another season and the reason for that will be you hating on it. Then again if the new season butchers the story of the series. Then maybe fans do have the right to be mad. Only then you can freely hate on this series. But other than that I really do hope fans of DxD can just deal with this massive change. Previous Post« Previous Naruto Death Theory Explained – Is Naruto Going To Die in Boruto?